When we talk about prestigious pharmacy schools, only one out of each ten students will get accepted for the study program. Will it be you? We will analyze the questions they will ask you in a typical admission interview, and also some questions you will have to deal with in an MMI setting. 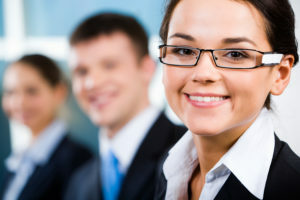 I will show you how to make a good impression on the people sitting in the interviewing panel, and how to succeed. Before we look at the questions, I want to talk about two important things you should remember while interviewing at Pharmacy School. If you want to skip this part and go directly to the questions, click here. What did you do to prepare for the pharmacy school? Are there any doctors or pharmacists in your family? Why do you want to study at our school, and not somewhere else? Pharmacy studies are hard and time demanding. Are you ready to handle that? What are you willing to sacrifice? For 90% of all applicants, this will be their first interview. The people in the admission committee won’t expect you to know a lot about pharmacy, drugs, and other subjects that relate to pharma. This is not a pharmacist job interview. What is more, they expect you to be nervous, and some of the admission committee members will be nervous as well! Bearing it in mind, do not let anyone else to stress you out. Expect the best. Try to have a clear mind, and with a strong belief that you can, and will succeed. Arm yourself with information about their school and study program (you will need the information to answer some of their questions), and with a good mood. This is the best “initial setup” for your success in the interview. It is their dream, but the student is not sure whether they want to follow a difficult path of pharmacy studies, or what they want to do in their life. Keep my word: Unless you know why you want to study pharmacy, unless it is your goal for the future (your dream), you will struggle to make a good impression in an interview. To be honest, if you are not sure whether you want to work as a pharmacist one day, you should not apply for a study program at a pharmacy school. You will only waste your time (with difficult studies), and a lot of money, and perhaps you will take a place someone else could get, someone who really is interested in the field. Ready to succeed? Sure you want to study pharmacy? Fine. Let’s have a look at the questions you will deal with in this interview. Non-verbal communication comes first. Whatever reasons you will refer to, you should speak with enthusiasm about your choice. They should feel that you genuinely want to become a Pharmacist, and do not follow a dream of your parents, or anyone else. 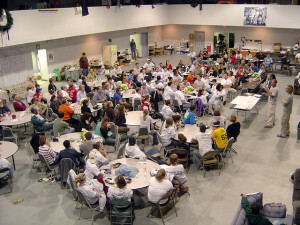 Focus on your interest for the field, and a meaningful purpose you see in this job. Do not talk about money. You can also say that you have always dreamed of the career, or that you follow a role model you have in your life (a pharmacist from your family, or a friend who became an inspiration for you as a great pharmacist). In a more original answer you can even talk about some innovation you want to bring to Pharmacy, or a research work in certain field you’d like to participate on. It can be AIDS related medicine, cancer research, anything. The more specific you’ll be in your answer, the more genuine it will sound. They do not want to hear that you already studied the subjects, or something similar—you want to get to the school to learn these things. But there are things that can help you to get ready—first and foremost you should refer to your research. Say that you talked to other Pharmacy students, that you did your research and understood what would be expected from you at school and what sacrifices you’d have to make to successfully graduate one day. You should sound at least somehow confident while answering this question. Unless you believe you can succeed, they will struggle to believe in your chances. You should tell them the truth, but at the same time ensure them that you made your decision, that your family members did not press you to apply for the Pharmacy School. If one of your parents owns a pharmacy, or if they happen to be your role model, you can mention this in your answer. This is actually good because it shows the interviewers that you have a clear and tangible goal you follow—to work for your family business one day, or even to run it. Special Tip: To know how to answer a question, and to come up with a great answer on a big day, are two different things. 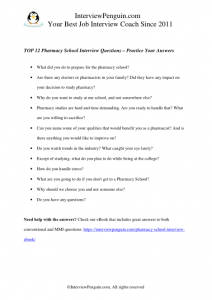 Check the new eBook I wrote for you, Pharmacy School Interview Made Easy, where you will find multiple brilliant answers to both panel interview questions, and MMI questions at a Pharmacy School (samples included on eBook page). The research you did about their school should help you to find a clear reason for your choice. Try to refer to good things: either courses you like in their curriculum (especially courses that are special for their school), or good reputation of their school and teachers (praising them for something will always help in an interview), or perhaps the research work they do. But it may also happen that you apply with an average pharmacy school (or even one that is below average), and praising them for something would sound bizarre to the interviewers. In this case, it is best to be honest. For example you can say that you like the location pf the campus (close to your home, no need to live at the dorm), or that your GPA wasn’t good enough to apply with one of the prestigious Universities—but you still want to pursue a career of a Pharmacist, and found their school as a great option. You shouldn’t wear pink glasses in this interview. Show the interviewers that you understand it will be difficult to succeed, and that you expect to devote most of your time to Pharmacy studies. In average, 10% of students do not manage to graduate from Pharmacy School. You certainly do not want to join their ranks. You can also say that you talked to other Pharmacy School students which helped you to understand what will be expected from you at school, and how challenging the experience will be. Can you name some of your qualities that would benefit you as a pharmacist? And is there anything you would like to improve on? Do you watch trends in the industry? What caught your eye lately? Except of studying, what do you plan to do while being at the college? What are you going to do if you don’t get to a Pharmacy School? Why should we choose you and not someone else? A multiple mini interview consists of a series of short, structured interview stations used to assess non-cognitive qualities including sensitivity, maturity, teamwork, empathy, communication skills, and other. The list of possible MMI questions is endless. But the interviewers always try to assess the same capacities and attitudes with these questions. A member of your family decides to depend solely on alternative medicine for treatment of his or her significant illness. What would you do? A patient requests needles and syringes at his/her local pharmacy. They do not present with a prescription, and based on the records you can access, they are not receiving treatment for diabetes. Do you sell the syringes or not? An eighteen year-old female arrives in the emergency room with a profound nosebleed. You are the physician, and you have stopped the bleeding. She is now in a coma from blood loss and will die without a transfusion. A nurse finds a recent signed card from Jehovah’s Witnesses Church in the patient’s purse refusing blood transfusions under any circumstance. What would you do? A patient with Down syndrome became pregnant. The patient does not want an abortion. Her mother and husband want the patient to have an abortion. What would you do in this situation? * See our eBook, Pharmacy School Interview Made Easy for more MMI questions, and a guide on how to deal with each of them (see samples on eBook page). Interview for a place at a Pharmacy School is not easy, but your success is not a question of luck. The better you prepare for the questions and for interview in general, the better your chances to succeed will be. Do your best, and believe in your chances. I know you can do it, and I wish you good luck! College interview questions and answers – General article about college interviews, and a guide on how to make an impression on the admission committee.